The Services Organization within Cisco is cultivating a broad culture change to strengthen our innovation capability globally, through a blend of top-down strategic alignment and bottom-up energy and creativity. The Services Innovation Excellence Center catalyzes this transformation through a combination of culture, process, and technology. Cisco (NASDAQ: CSCO) is the worldwide leader in networking that transforms how people connect, communicate and collaborate. With the network at the heart of every business, Services are critical for customers to realize the full value of their IT and communications investments faster. Contributing 22% of the company revenue, the Services organization at Cisco includes 13,000 employees in 85 countries helping customers to lower operating costs, increase availability, and optimize network performance. Services offers a broad range of capabilities that customers rely on to plan, build, and run Cisco networks and solutions delivered by Cisco and Partners. Plan: Cisco offers a full suite of consulting services that focus on network and IT infrastructure, security assessment planning and business transformation strategy and planning. Build: Create a network that is open, accessible, and secure. Implement and migrate solutions correctly, on time, and on budget. Integrate network services seamlessly. Manage: Our technical support, network optimization, remote management and automation and IT services are core to customer success at this stage. They speed issue resolution, ensure business continuity, maintain network performance and improve operational efficiency. Our entire portfolio is underpinned by Cisco’s groundbreaking Smart Service Capabilities that fuel performance, efficiency, and innovation. Organic innovation is embedded in the roots of the Services organization, with over 1,100 patents filed and over 300 patents issued in the past three years. However, by 2009 a convergence of factors convinced Joe Pinto, SVP of Cisco Technical Services, that a more structured innovation capability and culture was crucial. Technical Services, the largest component of Services, faced simultaneously increasing productivity pressures, escalating customer complexity, and the need to attract and retain younger talent with high expectations for participation and challenge. Pinto also recognized that our competitors were not standing still – they were continually improving. To stay ahead we had to develop a more holistic approach to innovation. Over the past two years additional executives have stepped forward to lead the charge across Services. The program is now co-sponsored by Parvesh Sethi, SVP of Advances Services; Debbie Dunnam, SVP of Americas Services Sales; Marci Meaux, VP of Services Transformation; and Joe Pinto. In 2010 I was recruited to Cisco’s Singapore office from Southeast Water, a government-owned water supplier for Melbourne, Australia. The city of Melbourne, after years of severe drought, desperately needed new solutions for a reliable water supply. The city had set aggressive targets for both water conservation and revenue growth, and my role was to create innovation to achieve these goals. After three years, the innovation program I built had engaged over 35% of the company in innovation competitions, and resulted in over $1.3M granted in seed funding for ideas. The program ultimately led the company to create a business growth department reporting to the CEO. At Cisco I was given a narrow charter to gather ideas from support engineers, but I knew from my water company experience that we could create a much bigger impact if I worked with the Cisco culture. Independence and decentralization run deep at Cisco, so there was no way that a top-down innovation program was going to succeed by decree. The organization was already innovating, but in a very uncoordinated way, not tied or aligned with high-level business objectives, and not pulling in a single direction. Certainly, this created a great opportunity to orchestrate and align, as well as frame and ignite innovation. Darren Scott, TS Globalization Director, gave us initial support and a strong emerging market focus. With enthusiastic executive backing from Joe Pinto, but no formal budget, credibility, or infrastructure, I needed to start small, demonstrate proof points, and earn organizational support organically. From this small beginning, over the past two years we have steadily grown, touching team members from dozens of countries around the globe, and demonstrating successes in people, process, and technology. The path has sometimes been bumpy as with all startups, but in partnership with the organization technical leaders, our Distinguished Services Engineers (DSEs), we have engaged, enabled, and empowered thousands of employees. We now have formal sponsorship and engagement from a number of business leaders in addition to Joe Pinto, including Parvesh Sethi, SVP of Advances Services; Debbie Dunnam, SVP of Americas Services Sales; Marci Meaux, VP of Services Transformation; and Edzard Overbeek, SVP of the overall global Services organization. Our opportunity now for 2013 is to move from Pilot to Scale across Services globally. What follows is a brief sketch of our approach, results, and lessons learned so far. 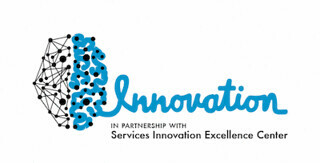 With the help of executive sponsors, we formed the Services Innovation Excellence Center (SIEC), a small center of excellence with a charter to build a measurable, scalable, sustainable, world-class innovation capability to accelerate the success of Services and our customers and partners. Gradually I scoured the internal Cisco network to recruit a global team of talented individuals who are passionate about innovation and driving change. This diverse team includes an experienced innovation facilitator and trainer, a 15-year Cisco veteran and expert in communication and brand, a Six Sigma Master Black Belt and Project Management Professional, a veteran of several Silicon Valley startups, and an organizational behavior and strategy expert. The team is spread across the globe in Sydney, Singapore, Bangalore, Shanghai, San Jose, Research Triangle Park, and London. Further, an extended team of “Ambassadors” in different roles and organizations provides the deep insight and connection into the needs of each business area. Ambassadors include both business leaders and Distinguished Services Engineers, senior technical leaders whose role it is to drive technical innovation and help business leaders align strategy to technical opportunities. In developing the SIEC strategy we were guided by a few core principles: Empowerment, Partnerships, Energy. Empowerment. For us, Inclusive Innovation means equipping the entire organization to innovate, and embedding innovation into the core operations of Services, rather than building a centralized innovation department. To this end we focus on providing enablers such as platforms, toolkits, and support mechanisms for innovators to drive their own ideas forward. Partnerships. As a small team, our success depends on forming deep partnerships across the organization and leveraging existing mechanisms where possible. For example, we partner with Cisco’s Learning and Development Solutions Group (LDSG) for curriculum development, training administration, and connection into development planning processes at the leadership level. Similarly, Services Career Central, a center of excellence that connects career management programs and resources across Services, has helped raise the visibility of SIEC across the Talent Development community and open doors with important stakeholders. We are also forging ties with the Services Strategy and Planning team to embed innovation as an element of the formal strategic planning and resource allocation processes. earliest adopters, is a prime example of this energy-building process. campaign, organized and hosted the first Innovation Day at the site. Dubbed “Innovation Friday,” the event began as an informal 4-hour gathering on a Friday. Rodney recruited a team of local enthusiasts who generated excitement and designed the session to be relevant and interesting for their peers. Consisting of a short innovation workshop, public recognition for innovators, and peer-to-peer idea sharing, the event was a hit. After the session Rodney and three other leaders reviewed the ideas generated in the session and delivered them to key program teams, thus extending the impact of the day. The Innovation Day practice went viral in TS and has been replicated at several other sites, each adding its own flavor and spark. Momentum-building such as this is taking many forms across Services. For example, inspired by the Innovation Day in Brussels, Laurent Demeur and Philip Smeuninx initiated an “Innovation Teatime” meeting series beginning in January 2013. Intended to help participants connect to innovation and mature ideas through collaboration, these Friday afternoon sessions are structured as casual snack meetings with drinks and treats. 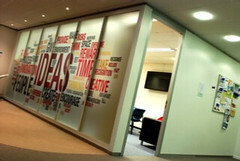 They take place in the Innovation Cube, an innovation-branded meeting space designed to encourage open discussions and creativity. A facilitator guides the discussion and ensures that an action plan follows to guide the idea submitter on next steps for advancing the idea. Additional Teatime initiatives are now taking shape in Krakow, Poland and Sydney, Australia. Veronique Boudaud, Senior Director, Technical Services has established “Eureka Innovation Teams” in Singapore, South Korea, Sydney, and India. These ongoing teams were given training, and specific challenges from their leadership to explore and solve in new ways. To date, 21 ideas in Eureka have received sponsorship and are being incubated. As team members participate in creating and experiencing these activities, they “catch the innovation bug” and stay involved because they see the importance and impact – and it’s fun! Our job as SIEC is to support that energy with a global process and learning infrastructure to propel the teams forward. By fanning the flames of local organizations, rather than imposing a centralized approach, we harness the phenomenal diversity of our 13,000 Services team members and remain relevant to local business leaders… whilst providing the centralized metrics, frameworks, and idea platform to ensure they are successful. Our challenge for FY13 is to formalize and scale the processes, tools, and metrics we have roughed out in our first two years. Integrated Strategy. The strategy that grew from these three principles weaves together several elements that over time will create large-scale, holistic change. We believe that our systemic, modular approach and deep leadership engagement make the overall impact unique. The four “vectors” of our Innovation Center strategy are described in detail below. Vector 1: Build Capability. Prepare the organization through training, tools, metrics, and leadership commitment. Vector 2: Ignite the Base. Activate and sustain broad engagement. Vector 3: Imagine the Future. Seek and drive opportunities with long-term impact. Vector 4: Change the Customer Conversation. Co-create with customers to help them solve their toughest business challenges while showcasing Cisco collaboration capabilities. The first vector is Build Capability. 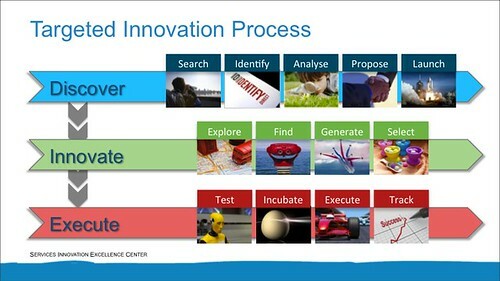 Our model asserts that innovation cannot be the “domain of the few” but must be the “responsibility of the many.” The Innovation Center provides the framework, tools, assets, and support to help Services organizations drive awareness and engagement, develop innovation talent, and execute with excellence. Our approach to building innovation capability is based on three interlocking elements: Innovation Maturity Pathway, Standard Tools and Processes, Innovation Certification. Innovation Maturity Pathway. Developing capability across a complex organization like Cisco Services is challenging. We needed a maturity pathway to provide a consistent set of objectives that simultaneously allows organizations to deliver a localized innovation capability while building on a standardized set of capabilities. 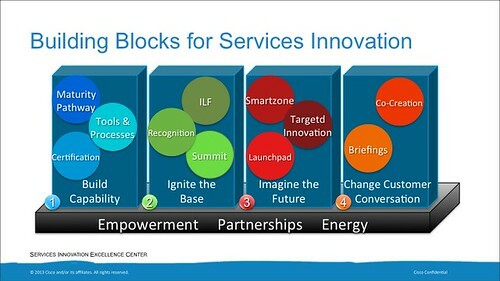 Two of our Innovation Center team members, Patrick Bradley , Innovation Manager, and Martin Daffner, Innovation Consultant, developed such a framework for organizations within Cisco Services. The framework serves as a guide to develop plans and measure innovation progress from Awareness, through Competence, to Excellence across 5 core dimensions of innovation maturity. One key to the Awareness phase is training. Our approach includes an “Innovation Academy” learning curriculum that, when complete, will comprise a blend of self-guided e-learning for individuals, instructor-led virtual sessions for teams, and intense face-to-face workshops targeting leaders. The training suite is being developed with external innovation experts and internal curriculum design professionals from Cisco’s Learning and Development Solutions Group. The offerings will be fully integrated into Cisco’s Learning Management System so participants can receive formal credit on their annual development plans. We have seen great success so far with the introductory “on-ramp” modules for both managers and individual contributors, touching nearly 1,000 Services employees across 5 countries, with satisfaction over 95%. How? Part of the unique “secret sauce” is approaching training as a community-building vehicle as well as an information-delivery platform. Our RTP site is a good example of this community-building power in action. Arun stepped forward and managed key logistics, provided crucial “on the ground” connections, helped formulate brainstorming challenges for the training (described below), recruited a technical team to answer questions during the training, and helped choose the prize-winning ideas from the day. Why did Arun go to all this effort in addition to his “day job”? He credits the original GTC Innovation Day where he saw firsthand the value of the training and recognition, noting that “This positive experience and the strong belief that the workshop would be valuable to our TS and AS community motivated me to help co-ordinate the activities." In-person sessions such as these will remain a core part of our Innovation Academy Suite. They are an important way for me, as Innovation Center Lead, to build personal credibility with front-line innovators around the globe. I believe that innovation, as a discretionary behavior, moves at the speed of that trust. However the model is not scalable to 13,000 Services team members. To meet this need we are beginning to harness Cisco WebEx and TelePresence technologies for virtual delivery of instructor-led training. We are also developing a short e-learning offering to pilot internally in March 2013. This fully self-guided course includes modules on general principles, thinking skills, processes, and organizational practices for innovation. Additional components of the Innovation Academy available now include a Leader version of the introductory module and a team training that we are in the process of scaling. Adjacent action-learning vehicles include Virtual Innovation Brainstorming and a facilitated Launchpad process (described below). Beyond training. As organizations progress along the maturity path from Awareness to Competence, leaders have the option to invest in an Innovation Rotation assignment for a high-potential team member. During this six-month in-place assignment, the Rotation candidate focuses on accelerating innovation in their part of the business. Specific Rotation goals are established between the sponsoring executive, the Innovation Center, and the candidate. Depending on the organization’s innovation maturity, the candidate may be assigned to recruit ideators, evaluate ideas, help prepare business cases, organize incubation teams, or drive innovation projects. The candidate receives training and coaching from the Innovation Center, mentoring from a DSE, broad exposure to executives and other contacts across Services, and an inside view of the innovation process. Two examples show the Rotation program in action. The Rotation program itself began in response to the energy of an individual innovator. It all started when Andrew St. Clair, a relatively junior engineer in our Sydney office, received an Innovation Catalyst award (described below in the Recognition section) for an idea he had submitted to one of our idea campaigns. We were so impressed with Andrew’s initiative that we partnered with his manager, Allyn Medway, to devise a 3-month experiment that has evolved into the Innovation Rotation. Andrew literally “innovated himself” into an incredible development experience. As part of his rotation Andrew worked to progress innovations across his organization – and drove his own idea through to implementation. The enthusiasm that Andrew brought to his role, and the impact he was able to achieve in a short time, inspired us to expand this modest experiment into a formal development program. Releasing a high-potential team member for a multi-month rotation is a significant investment by a leader. We have learned that several organizational conditions are needed to make this a practical reality. Visible leadership commitment to innovation, clear priority-setting to direct organizational attention to innovation , and consistent reinforcement from the top, together create the necessary climate for developmental investments such as the Innovation Rotation. Standard Tools & Processes. In moving from Pilot to Scale across all of Services—encompassing Advanced Services, Technical Services, Consulting Services, and Services Sales—an important focus for the Innovation Center will be to systematically document our processes and tools to accelerate deployment across the organization. Our core innovation process is Insight-to-Impact, which draws from an array of insight-gathering mechanisms at the early stages and culminates in realized business impact from implemented innovations. The Idea-to-Execution sub-process includes the most visible steps of the innovation process, stretching from idea generation to implementation. This sub-process, described below in the Imagine the Future section, is supported by the Smartzone idea management platform, also outlined in detail later. Innovation Certification. Providing organization leaders with a clear maturity pathway and standard tools and process is important, but not enough to make the changes stick for the long term. 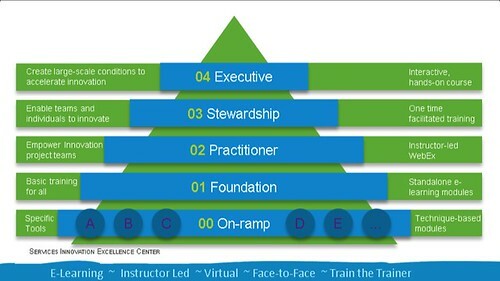 The final leg of the Capability triad is Innovation Certification at both the organization and individual level. In pilot now, this formal innovation certification, combined with deep operational integration into Talent and Business Planning processes, will solidify innovation capability into the DNA of the organization. Organizations that demonstrate meaningful progress toward maturity become eligible to certify selected individuals. At the individual level, “Master” and “Veteran” certifications, administered through an external certifying body, require formal training, project completion, measurable business impact, and demonstrated innovation leadership. 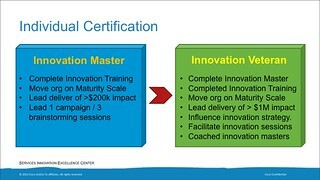 Certified innovators will have the accomplishment noted in their performance record and be assigned to manage and deliver innovation capabilities within their organizations. They will be eligible for Catalyst awards (described below) and will receive priority access to special mentoring and development opportunities. We are also working with HR to embed innovation certification requirements into promotion criteria for certain key roles such as Distinguished Services Engineer. 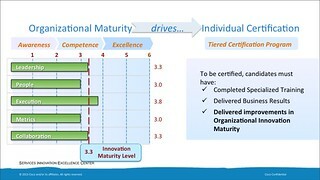 Individual and organizational certifications are interdependent: The maturity reflected in organizational certification is a precondition for individual impact, and the innovation leadership recognized by individual certification is needed to advance an organization along the Maturity Pathway. Ignite the Base, from newsletters and targeted communications to major, high-visibility events. 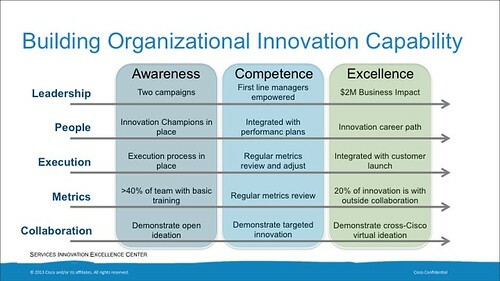 Three key mechanisms driven by the Innovation Center are Innovation Summit, Innovation Leadership Forum, and Recognition. Innovation Summit. The Summit is a high-energy gathering of Innovation advocates across Cisco, and a vibrant demonstration of senior executive commitment. The event is hosted by and oriented toward Services, but innovation influencers from across Cisco are welcome. 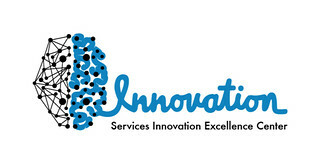 We have conducted three previous Innovation Summits and the fourth will take place in May 2013. Past Summits have featured external speakers such as Henry Chesbrough and Karl Ronn, and internal experts such as Dave Evans, Cisco’s Futurist in Residence. experiences and locally-tailored activities. Each regional Hub will have both a main-stage city (San Jose, CA; Raleigh, NC; Bedfont Lakes, England; Tokyo, Japan) as well as satellite events in major Cisco sites such as Beijing, Sydney, Bangalore, Boston, and Brussels. A central feature of the upcoming Summit will be a global Launchpad innovation competition, in which four cross-functional teams of high-potential professionals—one team from each global Hub—will tackle high priority business challenges during an intensive six-week facilitated innovation experience. The four teams will pitch their business plans onstage during the Innovation Summit to a judging panel of SVPs and a Senior Director-level Distinguished Services Engineer. The winning team will receive $20,000 in personal prize money and up to $50,000 in seed money for the idea. The Launchpad process is described in more detail in the “Imagine the Future” section below. Innovation Leadership Forum. Originally intended to be a small community of practice for Directors and Executives, the Innovation Leadership Forum (ILF), has mushroomed to a global membership of 1,000 innovation enthusiasts of all levels. Every six weeks, an internal or external innovation speaker offers thought-provoking ideas and examples for ILF members. The ILF has run every other month for over two years, featuring leaders from inside and outside Cisco including Soren Kaplan discussing ideas from his book Leapfrogging, Cris Beswick sharing insights from his work The Road to Innovation, and internal leaders such as Russell Craig outlining Cisco’s partnership with the UK government on the British Innovation Gateway and Guido Jouret describing Cisco’s Emerging Technologies incubation process. The format of ILF is a virtual WebEx session with presentation followed by Q&A, delivered twice to accommodate global time zones. We are also working to coordinate registrations with Cisco’s Learning Management System so that participants can receive learning credit for their engagement. ILF and Summit are important complements for one another. Together they help create an ongoing cadence of innovation thought leadership and energy throughout the year. To increase the value and impact of both offerings, we are developing an internal community website where participants can continue to discuss innovation topics and generate ideas sparked in the sessions. While the ILF brings Cisco and external Innovation leaders to an internal Cisco forum, the Innovation Center also exports innovation leaders to different events and venues. For example Carlos Pignataro and I represent Cisco on The Conference Board's Council on Innovation, a forum of innovation-focused executives that meets quarterly. We also speak externally about our innovation story: Carlos Pignataro delivered a lecture on Innovation Culture and Ecosystem at the NC State University Poole College of Management in December 2012, and we are planning to present at the Innovation Leaders’ Summit of the Conference Board in May 2013. We also regularly share this thought leadership with our customers – including 1,000 senior personnel within Bank of America. Recognition. We use a variety of recognition methods to appreciate the efforts of innovators and signal to the broader population the behaviors that are valued. 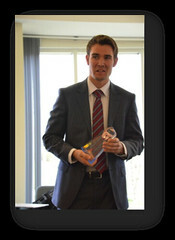 Innovation Catalyst awards are given to team members who have completed a pilot or prototype of their innovative idea. This honor is awarded regardless of whether or not the innovation progresses to final implementation, so succeed or fail, the Innovator is rewarded for their audacity and determination thus far. The award includes a $1500 cash prize, trophy, certificate signed by the recipient’s SVP, recognition at an SVP all-hands meeting, and an icon the winner can display on their intranet directory profile. Thirteen awards have been granted to date, for contributions ranging from incremental but highly effective customer experience improvements, to exemplary local innovation leadership in Japan, to a new service offering now being sold on the market. But the mechanics of a recognition program are not what activates contribution. For the Services organization, the true power resides in the underlying “value proposition” that motivates innovators. We are seeing clearly that as much as they value visible rewards, successful innovators want the permission and time to do it all again. We’re still deepening our understanding value proposition nuances for different “innovator segments”, but we have clues. Three key groups to understand at this stage are Distinguished Services Engineers (DSEs), front-line engineers, and Sales team members. Services. The leadership and passion of DSEs such as Carlos Pignataro, Rodney Dunn, Phil Remaker, Jason Davis, Vijay Raghavendran, Neale Rowe, Fred Detienne, Joe Clarke, Ammar Rayes and others has been core to the success of the innovation program. Carlos and others have freely shared guidance, connections, credibility, and constructive criticism where needed. They help translate our aspirations into plans that will make sense to engineers and leaders in the business. They serve on idea review committees, coach ideators, and keep us informed of the “word on the street” about innovation. Front-line Engineers. Cisco Services has thousands of front-line sales and support engineers and technical leaders who solve customer problems with compassion and commitment every day. What does meaningful recognition look like for this group? The most powerful way to recognize an innovator is for the organization to get behind bringing their idea to life through execution. Rodney notes, "When something you think of is made real it inspires you and others around you that Cisco really is serious not only about the idea but actually driving change based on those ideas. It becomes contagious when innovation is executed full circle." We have also discovered that being visibly and publicly recognized as an innovator can have career-shaping effects. Catalyst winners such as Arun Arunachalam, Gonzalo Salgueiro, and Errol Robichaux have become associated with innovation in the eyes of their peers and management. They volunteer for innovation activities at a higher rate and are offered new opportunities—and in the process they become some of our most effective innovation advocates. Sales. Beginning in January 2013, the field team led by Debbie Dunnam, SVP Americas Services Sales, began developing plans for innovation within the Sales organization. We are extremely excited to welcome this important new group. The customer perspective they bring will profoundly shape our understanding of the innovator value proposition not only for the Cisco Sales team, but for our customers and partners as well. We call the third element Imagine the Future to emphasize long-term breakthrough thinking. Imagine the Future is the engine that drives everything else. We have created processes so the organization can foster new ideas and drive them through to implementation, and all other efforts are designed to fill the pipeline and generate business impact. Three key elements of Imagine the Future are the Smartzone idea management platform, targeted innovation initiatives, and the Launchpad competition process. These are modular components that can be configured based on the needs and innovation strategy of the sponsoring organization. In each case there is a “vanilla” process provided by the Innovation Center, with options for tailoring the process for the client group. This modular approach allows us to focus on creating repeatable, scalable tools and processes, and frees the business group to focus on the innovation components needed to drive business results for that area. 100 ideas per quarter, with higher participation during focused “idea campaigns” as described below. Purpose. Smartzone is first and foremost a vehicle for ideators to gain visibility, receive feedback, and rally support for ideas. Their own initiative is essential. This emphasis on individual initiative is a critical departure from traditional suggestion systems in which people submit ideas and wait for “someone else” to act upon them. Smartzone supports individual initiative by providing ideators with a suite of video tutorials on how to strengthen their idea, build support, and move their idea toward implementation. Participation. All Cisco employees are welcome to participate in the Smartzone community, and this quarter we will trial granting access to selected partners and customers. Smartzone is “always-on” and ideas can be submitted at any time. The platform also supports targeted idea campaigns as described below. Progress. Submitted ideas are grouped into broad categories, and Working Groups aligned to each category meet biweekly to evaluate ideas and decide whether to advance, revise, redirect, or close the submissions. Working Groups are composed of key organizational leaders, Catalyst Award winners, and subject matter experts as appropriate to the topic. Members are selected by the Innovation Center because of their demonstrated support for inclusive innovation and commitment to advancing ideas. Working Groups decide which ideas to review based on a combination of factors. The “voice of the crowd,” in the form of votes and comments in Smartzone, is a key criterion. In addition, experts periodically review the full list of ideas to identify promising submissions that may have escaped notice by the crowd. Practices. For each stage of the Idea-to-Execution process, there is a set of tools, tips, and instructional videos that ideators can use to increase the success of their idea. In particular, idea submitters are encouraged to actively seek out coaches, collaborators, and feedback givers to help strengthen the idea. was frustrated. He had seen once again how difficult it was to troubleshoot a customer problem when the customer didn’t have an accurate understanding of how the network devices were interconnected. He wondered if it was possible to add more intelligence to the network and have the network tell him how its devices were interconnected. Gonzalo sketched out the basic idea of Topology Aware Network (TAN) and showed it to DSE Joe Clarke. The two filled a whiteboard developing a model for sharing topology information across the network. With the idea beginning to take shape the two went to Carlos Pignataro, also a DSE, for more collaboration. Carlos pressure-tested the idea to find gaps, extensions, optimizations, and uses. The dialogue helped the team understand the novel aspects of the idea and drove a patent application. This collaborative process transformed a spark into an idea, and further into an invention. The next step was mindshare and prototypes. The team entered the idea into Smartzone where others provided comments, support, and additional ideas to enhance the original concept. This led to an invitation to a Launchpad event where the trio presented the idea to a panel of executives who funded the incubation and prototype. TAN was on its way. With the current prototype, a network engineer can simply ask a network to display its topology, and an email arrives with an accurate topology picture attached, significantly reducing the time to resolve a customer’s problem. This leads to a significant reduction in the time to resolve the customer’s problem. Design Availability Assessment Procedure. 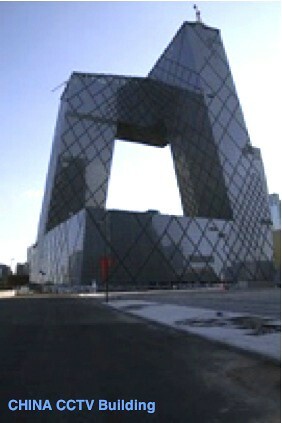 Errol Robichaux, an Architect in Advanced Services was helping design the network for the new China CCTV building. The unique shape of the building spawned several network designs, but which one would have the highest availability? This question led Errol to investigate the math behind a device’s Mean Time to Failure, and how to use that to calculate a network’s overall availability. He worked on this project for many months in his spare time, developing tools to do the calculations. Last year, Errol entered his idea into Smartzone, and saw lots of interest from the crowd and validation of his ideas. This led to an executive review and funding of his pet project, Design Availability Assessment Procedure (DAAP), which has become one of our newest customer services. Targeted Innovation Initiatives. A leader may also choose to run a targeted innovation campaign such as Ana Pinczuk’s 2010 idea campaign described above. Targeted campaigns have been used in many ways in Services: as part of the country-level innovation kickoff in Japan, to accelerate a business initiative in the Technology Solutions Group, and to generate energy leading up to innovation events, among others. The general structure of a targeted campaign is for the business sponsor to issue a challenge to a designated group of ideators, who then have a limited period of time—typically three weeks—to generate ideas and receive votes and comments. The sponsoring team evaluates the ideas and awards prizes or other recognition to the winners. Targeted campaigns tend to result in more strategically-aligned ideas than “anytime” submissions, and can be an effective way to draw attention to innovation as part of a larger engagement strategy. Launchpad. The Launchpad competition is another means of generating energy and recognizing innovators. Similar to the “Lion’s Den” or “Shark Tank” TV programs, Launchpad innovation teams have the opportunity to pitch ideas to a panel of executive judges for funding. Launchpad is typically organized to rapidly drive ideas to executive sponsorship. As with other Innovation Center processes, the Launchpad approach has some standard elements and some tailored to the specific implementation. 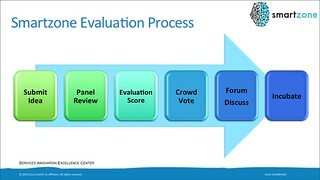 Standard elements include an onstage pitch answering basic business case questions such as market need, proposed solution, and payoff expectations. In all cases there is a judging panel of 3-6 executives who listen to the pitches, ask questions, and deliberate to decide on the winner. To date, funding decisions have been solely in the hands of the judges, but in the future we plan to include audience voting where appropriate. Funding levels vary according to the goals of the specific competition, but grants generally range from $25K-$100K for an idea. In keeping with the overall Innovation Center approach, the teams themselves are responsible for driving their ideas forward after the competition; however. idea funds may be used to hire contract resources if needed. Incubation Assistance. In some cases, funding an idea is not enough. Innovators may lack the time or skills to push their own ideas forward to implementation. A sister team, the Services Technology Forum, wanted to prevent innovation from being stifled by an inability to connect ideators with those who could execute on the ideas. They formed a small group of developers, business analysts, and project managers called the Services Technology Incubation Center (STIC). The STIC uses Smartzone to solicit ideas, and then they help build a business case, pitch the idea in a Launchpad competition for funding, and incubate the idea into a working solution. This important partnership between the Services Innovation Excellence Center and STIC provides an end-to-end solution for enabling innovation in the business. The fourth vector of our innovation capability strategy, Change the Customer Conversation, is our newest area of focus but holds the biggest potential for the future. A leading pharmaceutical company is partnering with the Services team to find new business opportunities for co-creation using collaboration technology to enable innovation. The company also approached the SIEC to understand how innovation can help their new state-of-the-art Shopper Science Center lead to new business opportunities. A large bank customer approached Cisco to learn how we innovate. The bank executives particularly liked the concept of Virtual Innovation Brainstorming as a way to innovate while providing inclusive opportunities for remote employee participation. This was key to winning a large WebEx deal over a significant competitor. A top-tier financial services customer asked Cisco to outline our innovation strategy and share lessons on how to build a culture of innovation. This led to several subsequent invitations to present at company events on the topic of innovation. A major power company asked Cisco to present to a group of senior leaders on creating and maintaining innovation capability. As follow-up, the SIEC was asked to give input into the company’s innovation strategy and provide ongoing implementation advice. We are now discussing the possibility of Innovation as a Service for the company. In addition to the above engagements, Innovation Center team members regularly present in Executive Briefing sessions for Cisco partners and customers, where innovation is a popular and frequently requested topic. Cisco is an engineering-driven company with a voracious appetite for data. The Services organization, in particular, relies on crisp execution and measurable outcomes to ensure we are serving our customers. Any startup initiative in this climate needs to prove itself quickly. An innovation program is at additional risk of being seen as “fluffy” or lacking rigor until results are proven. As illustrated in the Benefits & Metrics section below, we are rising to the challenge of delivering measurable business impact. Saving estimates from productivity improvements exceed $20M, and revenue projections from current projects is in the hundreds of millions. An even more fundamental success is the cultural change underway that gives us the inputs we need to deliver benefits to our customers and shareholders. Working across boundaries is difficult in any large organization, and Cisco is no exception. Yet our model relies on individual innovators and teams to drive their own ideas to implementation. Often this works very well, but sometimes the organizational barriers are too high for innovators to surmount on their own. In these cases, support beyond tools and funding is needed. The Innovation Center has fostered a number of important partnerships across Cisco that help clear the path for innovators to advance their ideas. For example, our partnership with the Services Technology Incubation Center described above is key to providing end-to-end support for innovators. In cases where the core innovator-driven process needs an extra boost, the high-touch STIC incubation model provides an important path to execution. Services Sales Americas is another critical partner, making it easier to link an idea to a customer need, or a customer willing to invest, which has helped open doors in other areas of the business. The scope, complexity, and global reach of the Services organization—and Cisco—is often an issue. Though our Maturity Pathway described earlier, we are driving global consistency with local adaptation. The Innovation Center provides the framework, tools, assets, and support to enable Services organizations drive global awareness and engagement, develop innovation talent, and execute with excellence. The Innovation Center owns and drives practices that require a deeper level of innovation expertise. Driving disruptive and radical innovations, for example, will continue to be led by the Innovation Center. In addition to the federated ownership model, we make extensive use of collaboration technologies such as TelePresence, WebEx, and WebEx Social to shrink distance and operate face-to-face across borders. Our ultimate aim is to deeply embed innovation into the DNA of Services, so that it becomes an implicit assumption for everything we do rather than an add-on program managed by a group of zealots. We must shift mindsets and mechanisms on a mass scale to make innovation as natural as breathing for the organization. To do this we must reach a critical mass of stakeholders as rapidly as possible. Our experience over the past two years has resoundingly validated our integrated top-down and bottom-up approach to change. By capturing the hearts and minds of grassroots innovators, influential technical leaders such as DSEs, and committed executives, we have been able to activate broad culture change through innovation. Then to keep the momentum growing and sustain the gains, we are using the Innovation Maturity Model and Pathway to embed innovation practices and metrics into the core operations of the business. “People who were originally skeptics are now genuinely excited and participation is quite high, which is a great indicator of morale and employee engagement. We are also building a reputation for innovation thought leadership as evidenced by the requests for engagements from our customers as well as our recent selection as a best-practice partner for the American Productivity & Quality Center benchmarking study on Open Innovation: Enhancing Idea Generation Through Collaboration. Of course we cannot run a business based on good feelings, however compelling. We recognize the need for a strong suite of metrics to quantify tangible business impact. We are beginning to tie metrics to the Innovation Maturity model, and as organizations across Services mature, we will work with them to improve how they measure the results of their innovation activities. In parallel, the SIEC will continue to improve the “aggregate” measure of overall Cisco Services innovation to show how our approach is delivering business impact. Employee Engagement: In the last employee survey cycle, key early-adopter organizations all saw major increases of 6 points or more for Innovation & Excellence. Leaders of those groups credited these results in part to the close partnership with the Innovation Center. This is a multi-year journey that is far from complete. We have learned many lessons along the way, and we continue to learn more. Here are a few of the key success factors that have been important for us. We have seen cases where a good idea will be selected for funding, but delivery doesn’t happen. In addition to money, we have found that we also need the right skills on the project—which may not be the skills that the innovator brings to the table. We also emphasize that the project should be aligned with the right area of the business so that the project is important to the business, not a side project easily cancelled. We have seen that great innovation happens when we include people from different perspectives. But it’s easier just to include people around us. We are intentionally driving inclusion from customers and partners, teams with diverse expertise, and different global perspectives. Creating something as new and transformational as a global innovation program is destined to hit snags. The key for us has been to keep listening, learning, and adjusting along the way, in partnership with key supporters and allies such as the DSE community and our executive Sponsors. As we’ve discussed, innovation has had a positive effect on the enthusiasm and passion of our team. That excitement leads to more participation and more innovation. The snowball keeps rolling. Innovation has many important intangible benefits, but we live in a metrics-focused world. Ongoing support and funding for innovation requires that the business receive increases in revenue, customer satisfaction, productivity, and cost savings. Fortunately, we are seeing all four. Special thanks to Darren Scott for bringing me to Cisco and helping to get this ball rolling. Thanks also to Lisa Voss, John Marsland, Carlos Pignataro, Joe Clarke, Patrick Bradley, and Martin Daffner for their contributions to this submission. And deep gratitude to my SIEC innovation squad and everyone referenced in this story, without whom none of this would be possible. Videos and slides imbedded above. It touched by the program is interesting to see the comments made. It is clearly not just driving a cultural change within the organization but the program about concrete business results. 100-105 Test In an industry facing commoditisation and threats on multiple fronts, very good, especially for an organization the size of Cisco. As an active participant in the early phases of the Innovation program i have been witness to some of the key components that Kate and team have put in place to truly accelerate the program across the business. 1. Combining a tops-down and bottoms-up approach. * Grass roots involvement through a variety of mechanisms, including Innovation days, Launchpad, smart zone, rewards and recognition programs. All fun and designed to encourage everyone, at all levels to be involved..
* Very strong executive governance. X-Functional governing body at the VP and SVP level as well as involvement and sponsorship from the E-Suite. 3. Middle-Management ownership - Through a maturity model, driving consistent development and competencies, as well as a "franchise" approach to scale, Kate is able to delivery organisational wide impact with a very small central team. 4. Inspiration - comprehensive communication strategy incorporating our customers, employees and executive team. The Cisco Summit will also connect the full services organisation (10,000 people) live, with hosted sessions this year in Tokyo and San Jose. As lead of Cisco's Consulting practise in Asia Pacific i see a number of customers looking at Kate's program through three key lenses of Cultural Impact; Innovation process and Technology enablers. An awesome job and program by Kate and team. Innovation has always been foundational for Cisco; one key shift that has emerged in the past years is the creation of a culture where everyone feels innovation is part of their role, and that they have the channels and support to innovate in their everyday role. 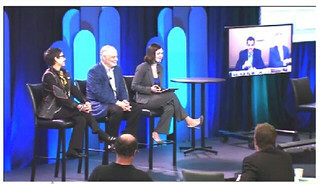 This feeling of empowerment has had a propagating effect; a new group of leaders have emerged, passionate and wanting to capture the opportunity rising from engaging everyone within the organization; people network in new ways and more freely across organizations, functions, and locations – internally within Cisco and reaching out to external parties. I have observed many of these new behaviours following a cross-functional innovation workshop we organized in Europe a few months back (thank you Kate for partnership! ), bringing together developers, account managers, service delivery teams, and many other functions. Following the initial dialogue many volunteer leaders emerged as well as new connections giving channels for ideas to be fostered to innovations. What an opportunity for any organization. I am thankful to my manager for giving me opportunity to be a part of Cisco Innovation Program. Earlier I used to think INNOVATION as a big Jargon. But now I understand, innovation is not only inventing something but it is also discovering an incremental improvement in the way we work which can save time, money or increase sales or productivity. After attending the training, my perspective to look everyday things like process and products we work on, have changed a lot. It has sparked a new way to look at things in our day to day life. Now I have a more holistic approach for innovation. I am now looking at things to work in more systematic way to nurture potential ideas and turn them into ‘INNOVATION’. Thanks Cisco for developing an innovation environment & culture, that will foster innovation. 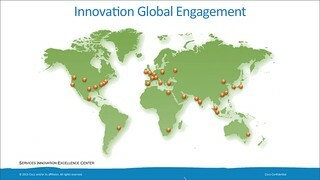 The Cisco Innovation program has easily been one of the most discussed programs in my experience with the company. People who were originally skeptics are now genuinely excited and participation is quite high, which is a great indicator of morale and employee engagement. There can be little doubt that this Innovation program is world-leading and world class. As someone who has watched the program grow over the past years, and as someone who is immersed in the global innovation community, I can say that there would be very few companies, if any, that have as diverse and leading edge an innovation program as that run by Kate O'Keeffe. Innovation requires focus on many fronts - people, connectedness, opennness, technology, collaboration, learning and development, rewards and recognition, to name a few. It is apparent that this program addresses all of these in a structured and systematic way with measurable metrics that are delivering significant outcomes. It is interesting to see the comments that have been made by people touched by the program. It is clear that it's not just tangible business results that are being delivered, but the program is driving a cultural change within the organisation. This is truly excellent, especially in an organisation the size of Cisco, in an industry that faces commoditisation and threats on multiple fronts. Innovation in these changing times is a key driver of growth and prosperity. This innovation program appears to have the opportunity of being game-changing for Cisco, and a model for other organisations. I see you're a keen proponent of Open Innovation – we hope to continue to build our program with that spirit of openness. Many thanks for the message of support from Down Under. Jami, Thank you so much for taking the time to comment on your experience at the Brussels Innovation Day. I'm thrilled that the event had such a strong impact on you and your team. You made my day! I understand a number of ideas from the Innovation Day are now in incubation – so congratulations to the local team. It's very inspiring to see that such a large-scale, ambitious Innovation program can be rolled out successfully in a company of Cisco's size. These kinds of programs sometimes take time to yield fruit- so it's brilliant to see that Kate's team has registered so many early successes. I'll be eager to see some of the longer term effects of these changes in the corporate culture over the next few years. As the CEO of Brightidea, I've had the good fortune to working alongside the SmartZone team and watch to the program evolve over the past several years. I get to peer behind of the curtain of literally hundreds of corporate innovation programs every year and Cisco's global program is probably the largest and broadest-reaching of it's kind. Many companies claim victory after automating a single innovation process but, as you can see, Cisco is making an 'all-in' bet to transform its culture and is executing with a 'do or die' urgency. Such a hard pivot would be impressive in a start-up, in global corporation with 65k+ employees it is downright impressive. This case is a great example of all the human touch points (strategy, events, facilities, processes, communications, training, ...) that are required to make a world-class innovation program work. Congratulations to Kate and team on all your success... onward to 2013! Matt, thanks for your kind words. I'm looking forward to continuing our strong partnership with Brightidea in the coming year! As the Manager of Management Innovation at my company, I do a lot of scanning for 'best of breed' ideas that we can use to spur innovation within our organization. Ms. O'Keeffe's story of innovation within Cisco is full of great ideas for us to pursue further. I also appreciate the detail and openness of the story. I look forward reading future updates about the progress and customer responses to their efforts..
Ian, Thank you for your comments. One of the areas that we are accelerating in 2013 is our co-creation and innovation with our customers. Perhaps we can work together? I took a role to drive the integration into Cisco process and culture for a small team that had been acquired, yet was physically located in an office that is not near the normal Cisco offices. I heard about an "Innovation Day" that Kate was leading in our Belgium office, and asked three of the team members to come with me so that they could learn about some of the things that larger Services organization had underway. A few months later, when discussing career opportunities, one of the attendees (who used to want to go to Sales) told me that he was committed to Services all the way - he said "I love services and don't want to work anywhere else". The level of engagement with employees that that this inclusive innovation approach builds is beyond measure. similar passions and diverse backgrounds come together to solve the most pressing customer and business problems has translated to more robust solutions. Those relationships then carry forward to future opportunities and results are realized more quickly with the experience gained. Innovation has been a driving force to bringing our organization closer together while working towards a common purpose. Innovation transcends all boundaries and has been a catalyst for organizational change. I was in attendance at one of Kate's Innovation workshops at Cisco Systems back in May 2012. This one was held in San Jose, CA and attended by local Cisco technical services engineers who work directly with Cisco customers to design and troubleshoot their computer networks. I can say 1st hand that there was a real thirst for these engineers to have a vehicle to share their ideas of how things could run better based on their very unique position of being technical experts that are exposed to real customer challenges on a daily basis. The Innovation workshop was a great way for Kate to teach some proven innovation techniques designed to build ideas, have the workshop participants split into small teams and apply these techniques to some sample topics, and then introduce the Smartzone tool as a way to submit these ideas formally for peer review. The workshop was very successful in promoting innovation locally in San Jose. It directly exposed front line engineers to tools that would enable them to self-promote their ideas autonomously and made it very clear to them that this was something upper management valued their participation in. The first time I learned about Social Network Analysis (SNA), it fascinated me. It instantly became a pet project of mine and I aspired to be able to use and run the analytics within the context of my work in Collaboration Change Management within Cisco Advanced Services. I worked hard to evangelize the idea on my own and I did have a lot of interest, but resources to test and pilot the capabilities inside Cisco were scarce. My manager supported the idea and sent me the link to the SmartZone for Services Enablement. I submitted the idea and by the close of the event I had the highest number of votes. Since then, the idea has gained momentum. We are currently in the second round of the campaign. I am, of course, thrilled to see my idea gaining visibility and the chance to be supported through incubation. In addition, the process of submitting the idea has connected me with other people who have similar ideas which has helped not only make the initial idea better, but has provided new additional use cases (potentially additional revenue streams) for the SNA capabilities. I love that SmartZone and the innovation process allowed me - one little fish in the big Cisco pond - to participate in the innovation process and create new challenges and opportunities for myself. SIEC increased the visibility of ideas among Engineers, Managers and Executives across the globe. This helped Innovators in identifying new use-cases and connecting with interested people from Services, Engineering and Product Management to form a collaborative virtual team with the objective to make the idea a reality ! Having been part of he journey to build the culture of innovation within Cisco Services, I would underscore the impact this work has had in engaging employees at every level. Within the Global Technical Center, we hosted an innovation drive that engaged over 2500 global employees, and surfaced opportunities for product, process and tool improvements. Our engagement scores have increased significantly as a result, and we find the team members more energized and willing to engage across borders, both geographical and organizational, to pursue opportunities to improve the business. Having worked with Kate, John + Carlos on and off over the past few years, I can attest to this incredible story of growth and scale in a relatively short period of time. They are truly collaborative, partnering not only in the Services organization, but also across HR, IT and beyond to build innovation capability and leverage the energy, excitement, ideas and best practices of all. This is a great story of organic innovation growth accomplished through executive support, and bottoms-up work and dedication. Strategically planning + managing innovation is not an easy task, but when done in this way it is successful.